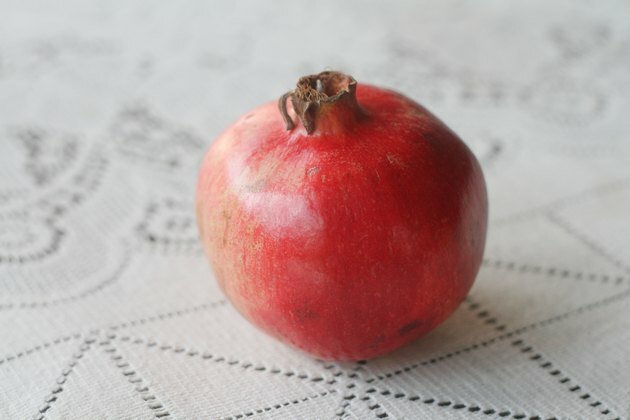 How to Tell If a Pomegrante Is Ripe? Pomegranates are versatile fruits, which are used in a variety of juices, jellies and sauces. This juicy fruit is also a candidate for eating plain or for use in dessert flavoring or wine. If your intention is to pick ripe pomegranates, knowing what to look for is essential. 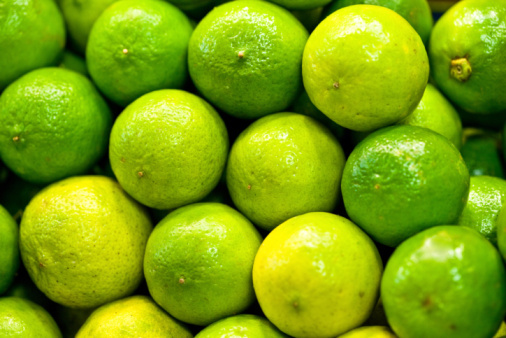 Avoid choosing fruit that is under or over-ripened by making careful observations. Assess the color and condition of the skin. Ripe pomegranates range in colors from dark pink to deep red and feature shiny skin, with no cracks or blemishes. Unripe pomegranates feature lighter skin, which may even appear green or yellow. Overripe pomegranates are darker in skin color and often contain cracks and blemishes. Check out the size and weight of the fruit. 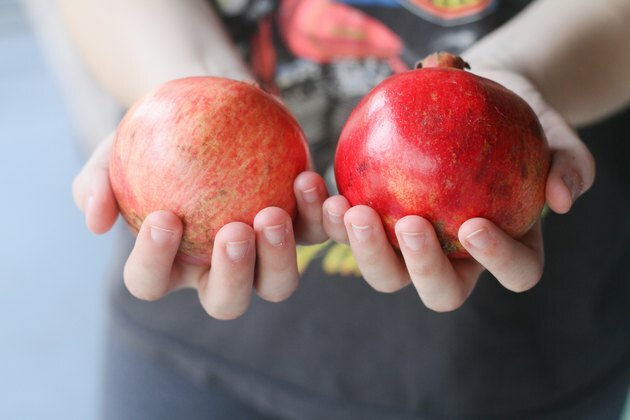 Keep in mind that ripe pomegranates are usually the size of softballs, while unripe pomegranates are smaller. 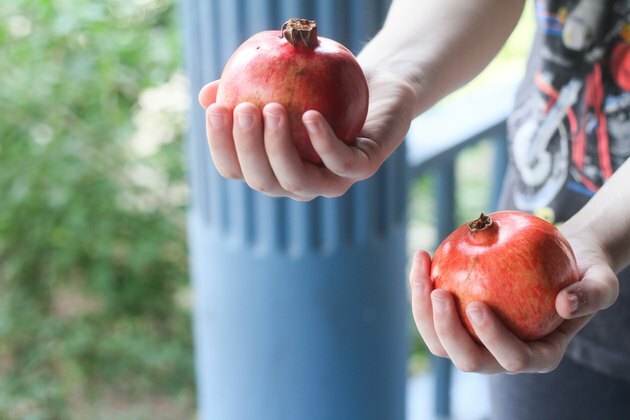 Place a pomegranate of unknown status in your extended arm and open palm. Gently clasp the fruit, while raising and lowering your arm two to three times to assess the heaviness of the fruit. Repeat this process with an unripe pomegranate for comparison. Ripe pomegranates will be heavier than unripe fruit because they contain more juice and larger seeds. Listen to the sound the pomegranate makes when tapped. 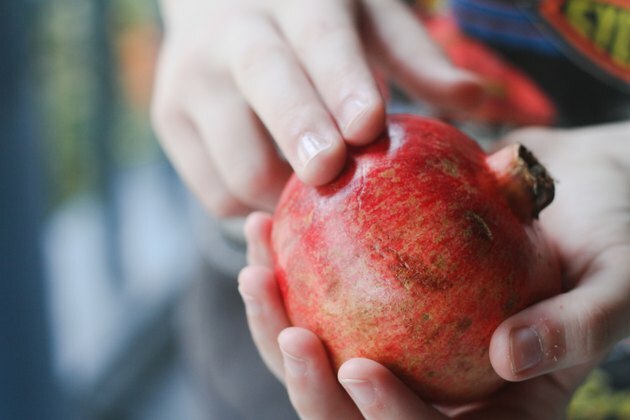 Hold the pomegranate of unknown status in one hand, while using your index finger to tap the outer skin two to three times. Ripe pomegranates produce a "metallic" sound when tapped due to the large amount of juice inside the fruit. Unripe pomegranates produce a hollow sound, while overripe pomegranates produce muted sounds and may bruise when tapped.